Bismarck dried packs a punch with both sheer fire power and elegant beauty and now she’s coming to AGP! 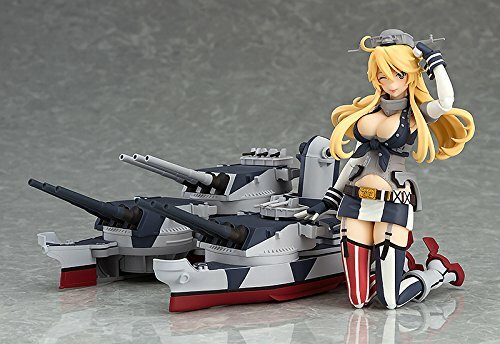 You can pose Bismarck dried supporting the massive firing cannons on her shoulders, or you can pose her commanding her craft perched and ready for battle. The beautifully detailed interchangeable facial expression parts expand posing opportunities even further, including allowing the possibility to recreate a partially damaged Bismarck dried. Set includes ship armament parts, interchangeable facial expressions (x3), interchangeable hands (x3), handheld weapon, and special display stage. From Max Factory. From the popular browser game Kantai Collection ~KanColle~ comes a figma of the heavy cruiser, Prinz Eugen! Using the smooth yet posable joints of figma, you can act out a variety of different scenes. She comes with three expressions including a smiling expression, embarrassed expression and a confident expression for bombarding her opponents. Her ship parts with the characteristic dazzle camouflage can be attached and removed and all of the turrets are articulated. Alternate front hair parts are included to display her without her hat. An articulated figma stand is also included. From Max Factory. From the popular browser game Kantai Collection -KanColle- comes a figma of the Iowa-class USA battleship, Iowa! Using the smooth yet posable joints of figma, you can act out a variety of different scenes. Three face plates are included: A cheerful smile, a winking expression as well as a rather mischievous damaged expression. The ship parts on her back can be completely detached. Each of the cannons on her turrets are independently articulated. An articulated figma stand is included, which allows various poses to be taken.